Shorto’s books are geared toward the layman reader of history and they are packed with information while written in an informal, somewhat chatty and digressive style. I had no idea Amsterdam had such a fascinating history. Shorto writes well bringing to light a delightful cast of historical characters, some familiar, others not at all. I think I really want to visit now and see some of these places. Here Shorto’s main theme is to show how Amsterdam’s history and development was based on expanding tolerance and individual freedoms in order to work together as a community more effectively. This was called liberalism for a long time but today it’s a bit more complicated – qualified in some ways. From taming the marshy landscape in medieval times to a travelogue of today Shorto limns the turning points of Dutch history highlighting important figures such as Rembrandt and Spinoza and zooming in on certain events and eras. It’s really fascinating. I wasn’t aware of Holland’s early explorations towards India but I was certainly aware of the exploits and profitability of the Dutch East India Company – still, always new info – the stock market section, for instance, or the contributions of Jan van der Heyden to urban civilization – Amsterdam has a very interesting history. 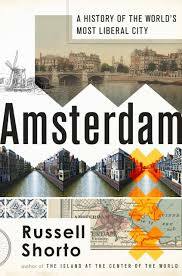 And as part of this book is a travelogue Shorto explores Amsterdam and visits some interesting residents. I’d love to visit the home of Jan Six XI (tenth!) what a fabulous thing to see. I think it’s on my bucket list.